Stick with the JFK coat sleeve. Prove what we are seeing on that sleeve is the result of a 4th bullet = 2nd shooter. Then proceed to where that shot originated. Going right into an Umbrella Shooter is a "cart before the horse" situation. It would help your case if you can find visual proof placing a time stamp for the sleeve damage occurring Before the Kill Shot. On this forum, you continue to be 2nd to none when it comes to this type of JFK Assassination investigative work. Wait, those two dots from the umbrella are NOT the projectiles? What are they supposed to be? Well I haven't posted everything I've been researching. I am just reposting this since the site got hacked. 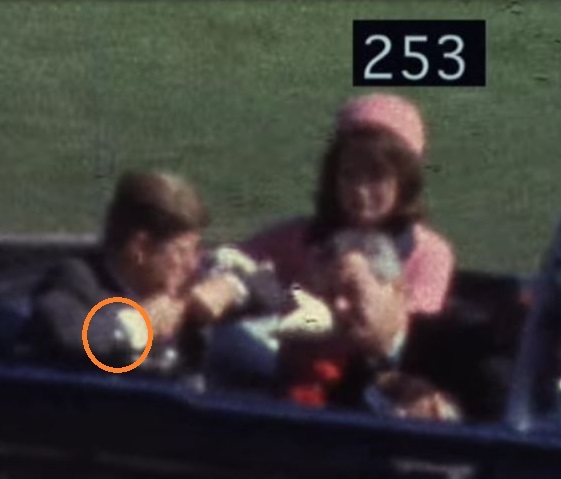 If you look at these Zapruder frames (I've tried to find the clearest frames) they, indeed, appear to show a white mark on the coat sleeve before the fatal 313 head explosion. Of course, it's not 100% this is the slashing mark on the sleeve I have noticed. This could be a coat button -- I haven't, yet, determined that. (A) white mark on the sleeve is present before z313. TBH, other than the clearest 253 frame, they're not really clear enough to tell what that white patch is, either button of the mark I've spotted. I haven't found decent enough frames to really tell. There are several frames that show a faint white mark. They're in the correct area of the slashing mark on the coat sleeve, though. And the mark wasn't there on the sleeve before the assassination. Just seconds earlier. If you mean the orange, what I called flashes, I presume they're coming out of the two openings that also appear in Willis 5. Muzzle flash? I don't know. I have done some research on the weapon Helm's described to the Church Committee as the 'nondiscernible microbionoculator' which was electronically capable firing mechanism - launching self propelled darts, or firing small calibre bullets. This was part of “M.K. Naomi'' -- which isn't entirely declassified, so we know nothing of the weapons in use. I know the Chaney debate. But what if the umbrella shooter fired and those lights are actually from the umbrella - and clever painting disguises them to be Chaney. I personally believe the umbrella weapon is capable of firing self-propelled missiles. Electronically triggered, not creating muzzle flash (going from everything I've read) I have some text from Col.Prouty, which he observed the alleged umbrella weapon system live firing at a goat. To pick up your question that has to do with the explosive bullet of the JFK era, I shall open Leonard Moseley's fine book, DULLES. On page 459 it provides some good comments on this bullet, etc. by commenting ALLEN DULLES: Now he was interested in the more sinister Agency experiments in mind bending drugs, portable phials of lethal viruses and esoteric poisons that killed without trace. Allen's sense of humor was touched when he learned that the unit working on these noxious enterprises was called the Health Alteration Committee (directed by Dr. Sidney Gottlieb and Boris Pash), and he added to his collection of CIA curios a noiseless gun which the committee had produced for firing darts smeared with LSD, germs, or venom at enemy agents or foreign personalities whose existence the CIA was finding embarrassing." You will note, in this opener, we have the names "Gottleib and Pash." It just happens that Gottlieb died on March 7, 1999 in Washington, DC. I worked rather closely with him and his staff, MKULTRA during certain years of my assignment in the Pentagon under Gen. Erskine and with Lansdale. This is where our story begins. One day Lansdale came across the hall to my office with a man whom he addressed as the "Inventor" of a new small, and special weapon which he would like to have us study. The man remained in my office for an hour or more as he took that small weapon that was little more than a high-powered "dart" that was fired from a pipe-let about the size of a "milk-shake straw". The tip of this device could be loaded with a high explosive, and the whole thing could be fired through this "straw" from any small pipe, or barrel. In his eagerness, he inserted one into a straw section about 10 or 12" inches long. Then he lightly touched a small button and in a silent instant it flashed across my office, into the wall on the other side. As he calmed me down he told me that this device could be fired from many devices...one of the best might be an ordinary umbrella modified to fired it through a "straw-like' tube at high and silent speed. It would be silent and would explode upon hitting its target...say another human being. A week later Ed Lansdale and I took a helicopter ride from the Pentagon to a special laboratory that had been working with the inventor and some of their staff of specialists. In a short time they had adequately demonstrated this new, silent device. It killed a goat at a distance of about 30-40 feet. Of the many devices these men had worked on was an umbrella. The handle contained the hand-activated, silent trigger. This fired the small rocket at the goat. The deadly part of this tiny weapon was a sight set at about the sight in the handle to be even with a tip of the umbrella rib. The sight and umbrella were designed to be in a perfectly straight and level line. The dart would hit the "target-animal" silently and at high speed. Then it would be exploded with a terrific burst inside the body of the target. Anyone could see that this weapon was lethal. Lansdale and I returned to the Pentagon and as far as I recall this device was entered into the MKULTRA arsenal of special "toys." I believe that this is the weapon you have described in your e-mail message. I have always believed that it would be uncovered in due time. Perhaps the timely death of Col Gottlieb. opened the door. Much can be said about this weapon and its possible utilization as the JFK assassination tool. You may be interested to know that there is a new assassination book, "ASSASSINATION SCIENCE" on the market by a skilled team of doctors who are familiar with the JFK Assassinations and the medical work that has been studied since then. I suggest you get the book, and speak to these specialists. I think in saying they may have cleverly airbrushed the muzzle flash to look like Chaney's reflection is reaching way too far, imo. What you have is all speculation based on photographic images. 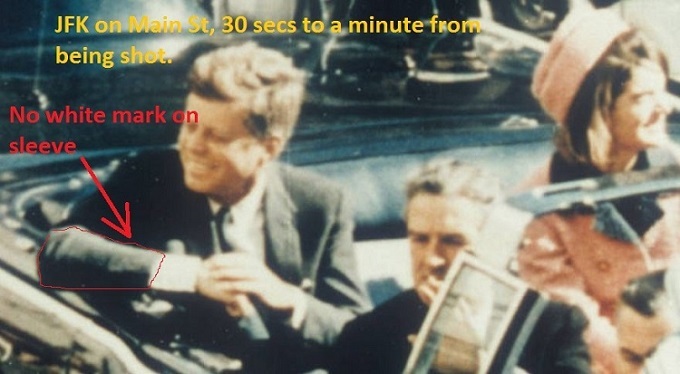 Ay this point it seems more logical to assume those are reflections of Chaney and the white dot on JFK's neck is the same type of artifact I see all over those images. I saw many appear around Jackies head that look just like the JFK dot. Enhancement programs do add things like this so at this point I don't find your argument compelling. In order for a bullet to be captured on film the film has to be running at about 2,000 frames per second. 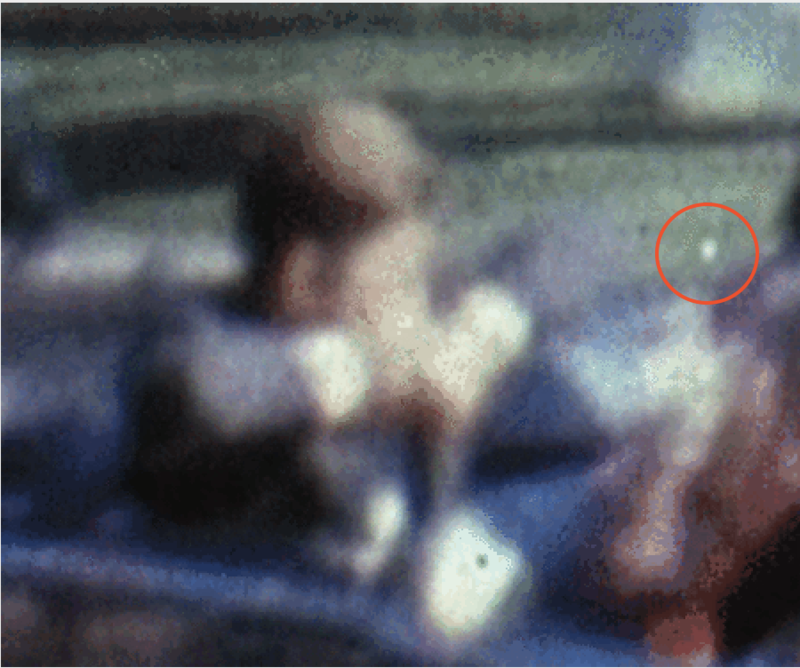 The Zapruder film did not and could not capture a bullet or any projectile. What you are pointing to on the suit coat sleeve is brain matter. Nothing more. Go to the national archives and view the prints. The matter is as clear as a tolling bell. Robert Reeves has documented that the "white dot" on JFK's (R) coat sleeve appears on Zapruder frames #253 and #254. This "white dot" would therefore be on JFK's coat sleeve Prior to Z Frame #313 which is when the Kill Shot struck and JFK 's head exploded. This would disqualify that white dot on the coat sleeve as being "brain matter". 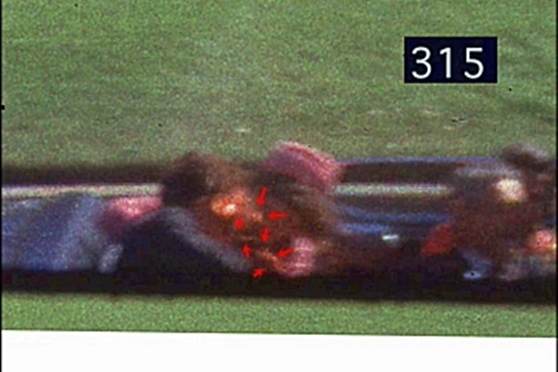 That is, unless you are inferring there has been alteration done to the Current Zapruder Film. Funny how you are now an expert on the condition of the right sleeve of JFK's jacket even though you have never ever even personally inspected it. Or have you? I have contacted the archives and requested a photograph of the area in question. Hopefully they will grant me a close up of the marked area. I have been in contact with the last person to physically handle the coat and even he wasn't sure he saw brain matter over a tear in the fabric. At the moment all we have is speculation. If I am granted any photography of the jacket sleeve I will post it here. It isn't any funnier than you creating all kinds of theories and seeing things in the films and photos that aren't there, or, they aren't what you claim they are. No, at the moment, we do not have speculation, re the pink matter on the coat sleeve. You apparently haven't examined the clearest Zapruder film frames. Are you not aware that there are several large bits of brain falling from the head wound downward and into the path of the arm of President Kennedy? I have never claimed to be an "expert", but I do use common sense, and I do see brain tissue falling in the direction of the upraised arm. Some of which landed on the arm suit coat.